Once owned by Mike Malone, this was possibly Jerry's last piece. A classic blended with Japanese design elements. We've never seen the dragon used this way before, it's usually a damsel in distress. Wonder what Jerry was saying? Lightning bolts, sky in turmoil, the sea thrashing with sharks. The Dragon's not giving up in this land, sea and air battle. Sailor Jerry looking the devil in the eye. Tell "em Jerry! Norman Keith Collins known as ‘Sailor Jerry’ born in 1911 was a very popular, well-known American tattoo artist who focused his art on sailors. Before Collins became ‘Sailor Jerry’ he lived in Chicago in the 1920’s where he was taught to use a tattoo machine and would practice his art on drunks. Collins enlisted in the United States Navy at the age of 19 where he would travel at sea and was exposed to Southeast Asian art. Collins continued sailing Asia and the Pacific sea and ended up sailing to Hawaii where he eventually opened up his own studio and spent the rest of his life. Collins art stems from what he was exposed to, which was the typical ‘American Sailor’ religion and Asian designs. 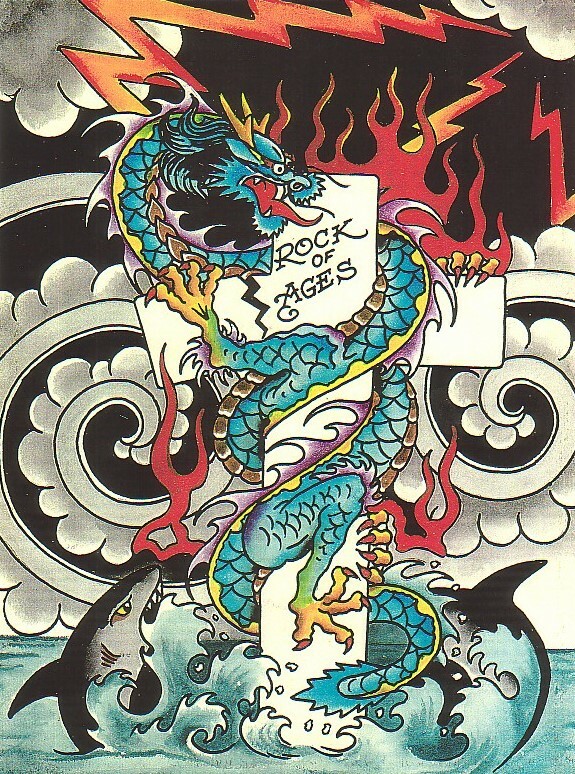 Some popular symbols Jerry used were bottles of booze, snakes, dragons, women, crosses, weapons and many more. Each symbol/ object had a meaning behind it. For example the anchors represent stability since they are the most secure object in a sailors life and journey. The anchor is a reminder of what keeps you stable. 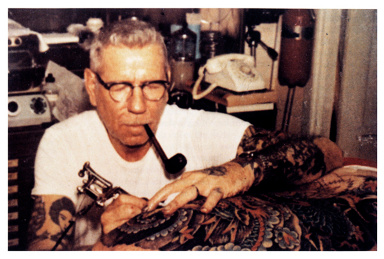 Sailor Jerry himself was covered in tattoos and wore white t-shirts to expose them. Sailor Jerry helped change the tattoo industry completely. During these times there were only few colors available for tattooing so Sailor Jerry developed his own safe pigments that created much less trauma to the skin. Also he was the first to make use of single-use needles and hospital-quality sterilization.